Apple MacBook Air (13-inch, 2012)The MacBook Air is just as beautiful and portable as before. The notebook is still the same size (12.8 x 8.9 x 0.11-0.68 inches) and weight (3 pounds). It's no surprise that Apple patented its wedge design. The all-aluminum chassis, elegant and functional, is now a classic. Apple MacBook Air (13-inch, 2012) DisplayNo changes here. The MacBook Air's 13.3-inch screen has a resolution of 1440 x 900, which, while not the Retina display some were hoping for, still provides the same wide viewing angles and bright colors as last year. A 1080p YouTube Trailer for "The Avengers" showed excellent contrast, deep, true blacks and fiery red explosions. Apple MacBook Air (13-inch, 2012) Backlit KeyboardThe backlit keyboard on the MacBook Air hasn't changed since last year, and that's a good thing. It's hard to improve on perfection. The island-style keyboard has just the right amount of spacing, travel and feedback. We've found on other Ultrabooks that keyboard ergonomics occasionally take a backseat to thinness. And, no one has yet to offer a wide a range of backlighting levels as the Air. Apple MacBook Air (13-inch, 2012) TouchpadIn the same vein as the keyboard, the 4.1 x 3-inch glass trackpad is as spacious and accurate as ever. Multitouch gestures, such as the four-finger swipe to reveal Mission Control and pinch-to-zoom, were effortless. Clicking always feels solid, and we never had to deal with poor palm rejection when typing, which plagues some Ultrabooks. Apple MacBook Air (13-inch, 2012) PortsIt's nice to see that the MacBook Air now houses two USB 3.0 ports (one on each side) to accommodate high-speed peripherals. The Thunderbolt port on the right is faster, but the universe of compatible devices is still quite small. The left side also houses the MagSafe connector for power as well as the headphone jack. The SD Card Slot on the right still doesn't let you insert cards fully, which is a bit annoying. Air webcam vs webcamThe Air's 720p FaceTime camera delivered crisp, clear images with accurate colors. It's a definite step up from the VGA camera in the last Air. However, as with most webcams, it had trouble when there was a bright light source behind us; our face became silhouetted. When we captured our face with the old and new Air side by side, there was a much greater level of detail coming from the FaceTime HD camera. 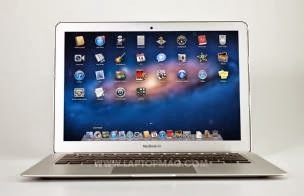 Apple MacBook Air (13-inch, 2012) OutroThe 13-inch MacBook Air remains our favorite ultraportable notebook. In addition to best-in-class ergonomics, loud speakers and a svelte profile, you now get faster performance and much longer battery life than the Ultrabook competition for $100 less than before. The only reason we dropped the rating from a perfect 5 stars to 4.5 stars is because some Ultrabooks offer higher-resolution screens and more compact designs. Nevertheless, the MacBook Air is still the one to beat.